Over the past few weeks, I've been slowly clearing out the rat's nest of paper that I have gathered around my office...yet again. I am thankful it never gets as bad as this woman's! My piles seem quite 'mole-hill' in comparison, like 3-4 file boxes worth. 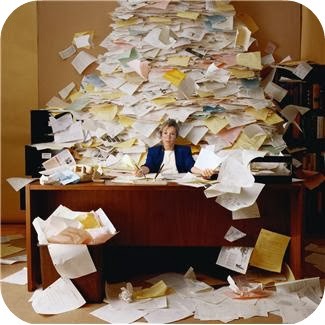 However, there are some days when I feel totally overwhelmed by paper. What can I say? I love paper ... in all its glorious forms. You name it, magazines and clippings, website articles printed off (even though I keep saying I'm not doing that anymore), pretty notepaper and stationery, empty notebooks waiting their turn, not to mention comments from people who have encouraged me in some way. It starts out neat, but then 'someone' makes it all messy again. It's so easy for me to hang onto yet another sheet filled with inspiring words, ideas, photographs... and, as it turns out, even the scribbled musings from my own pen. In all that fore-mentioned paper tangle, I came across a writing exercise inspired by Natalie Goldberg from her book Old Friends From Far Away. Rather than throw it out entirely, or keep it for a writing date in the future, I decided to share it with you today. Mind you, be warned, it is in its wordling, unedited form. I wrote this sometime earlier in the year. The Instruction: Keep writing, no editing, and allow the thoughts to rise. If you get stuck, start a new paragraph and continue with the same prompt. I am looking at the moss green cozy blanket flopped on top of the light comforter on our bed. With the downpour this afternoon and the air cool, it feels perfect to cozy up even if it's a summer evening. And I am looking at the open window -- Rick would ask why don't you close it if you're cold, but I love an open window too much to worry about the cool breeze wafting in. I am looking at Natalie's book about writing memoirs propped up with my left hand, as I have the page-wrapped over the top edge notepapd laying atop my lap, as I'm propped against my pillows (mmm...what's with all the propping... this might lead somewhere interesting). I am looking at the clock ticking away and it's 7:10 pm and I should be sleeping already. I tend to get a little knot in my stomach as I think I have to get up at a few hours -- generally unrested and sore and irritated because I can't start (my day) more leisurely and meditatively. I am looking at a new page -- last one not yet flipped over and tucked completely behind the cardboard back. I am looking at this exercise as a utilitarian one -- and not taking the effort to create beauty in the midst. I am looking at the week ahead and wondering if it will be any different than the last one or the one before that and the one before that one. Instantly the thought comes of the time when going away on holidays and coming back home to the boredom and tedium of daily life was very distressing for my mind and heart (at that season). Because I'll always remember when I was looking at the lovely rainbow that we drove under on our way home from holidays and the promise the Lord gave me that I was not going home the same way I came/left. It helped. And so.. we have a posting, I can put that piece of paper in the recycling bin, and we hope you will have some fun reading it, as I had fun writing it this morning. We're off... breakfast of French Toast which hubby is making, a meeting with our Writers Fellowship executive, and then a rare treat concert at the symphony tonight to hear my most favourite composer Wolfgang Amadeus Mozart. Oh my goodness, I wouldn't want to have to sort all that paper out. I enjoyed reading your writing exercise, and at least here it only takes up virtual space. And as "I'm looking at"....the clock which now says 5:39 pm...not quite supper time but maybe time for a cuppa something. A blog makes a lovely file cabinet! You should do this more often! It could be the answer to some of those pieces of paper. Ah Brenda - thanks for sharing...being a paper lover and clipper as well I certainly identify. Love your thoughts on "I am Looking at..." Brings a smile when you shared about the window open - I too love the breeze even if it is a chilly one. Take care and have a blessed day. Wordlings (what a fun word) seem to multiply around here, too. Delightful post, Brenda.